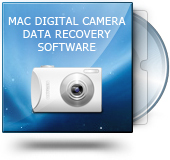 Description : Purchase Mac Digital Camera Data Recovery Software to restore digital photographs, favorite pictures, audio, video albums, snaps from all major digital camera devices. Mac digital camera data recovery software restores missing photo albums, when memory card is pulled out while digicam is still on working mode. Picture retrieval application for Mac has advanced inbuilt deep scanning recovery algorithm to recover lost digicam saved data. Rescue deleted or lost picture files from all types of digital camera.